Steiff Paddington 60th Anniversary Discounts Apply ! Made from The Finest Cinnamon Mohair and dressed in his usual outfit. Mrs Brown bent down. You are a very small bear, she said. I am a very rare sort of bear, he replied importantly. There are not many of us left where I come from. And where is that? asked Mrs Brown. Darkest Peru. Michael Bond based Paddington bear on a lonely Teddy bear he noticed on a shelf in a London store on Christmas Eve 1956, which he bought as a present for his wife. The bear inspired Bond to write a story; A Bear Called Paddington - first published on 13 October 1958. Little could he have known then how many people from around the world would come to know, love and adore his small bear from darkest Peru. Paddington is eternally optimistic and always comes back for more, no matter how many times his hopes are dashed, It's simply the joy of a little bear who is an outsider getting into scrapes and mishaps - always with the best of intentions and coming out on top every time. Michael Bond To celebrate the marmalade-loving BAFT nominated bears 60th anniversary Steiff are honoured and thrilled to offer two winning designs. Our first Paddington pays homage to Peggy Fortnum, the first illustrator to draw Paddington Bear for Michael Bonds childrens books. She was commissioned to illustrate the first volume of adventures, A Bear Called Paddington, in black and white line drawings, in 1958, and worked on the next eight Paddington books. Her illustrations made the idea of a bear from Peru arriving at Paddington station with a suitcase and being adopted by an ordinary family seem perfectly reasonable. 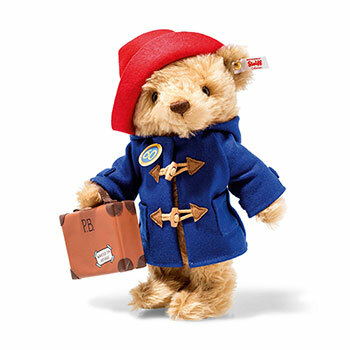 This special anniversary Paddington comes complete with a specially commissioned 60th anniversary logo. 5-way jointed, with Safety eyes and stuffed with synthetic filling, and with gold-plated "Button in Ear" with elephant motif and Surface Washable.